Inflammatory rheumatic diseases, in general, have substantial financial implications.1,–,4 Recently, the broadened therapeutic armamentarium with biological antirheumatic drugs has led to marked improvements in disease activity and joint damage, but has dramatically raised direct medical costs.5 Rheumatoid arthritis (RA) often affects people at an age of high work productivity6 and has significant consequences on physical functioning and working capacity.7,–,9 Incorporating indirect costs due to loss of productivity7 allows for a more complete look at the economic implications10 of RA treatments, and is recommended for sensitivity analysis.11 The GRADE recommendations for the development of guidelines12 encourage the incorporation of economic issues. To account for this, we systematically reviewed existing evidence on the cost effectiveness of RA treatment options to inform the recommendations for therapeutic management of RA. In November 2008, the European League Against Rheumatism (EULAR) created and charged a task force to develop a guidance document for the use of synthetic and biological DMARDs in RA. The expert panel decided to deal with the cost effectiveness of therapeutic options in one of the five subgroups examining different aspects of the therapeutic management. To collect and review the evidence, we performed a systematic literature review (SLR) aiming at economic evaluations of RA treatment. The search used Medline, Embase and Cochrane databases to identify publications concerning economic aspects of adult RA, published in English from the year of database inception until December 2008 (Figure 1). In addition, we hand-searched abstracts presented at the 2007 and 2008 ACR and EULAR conferences. 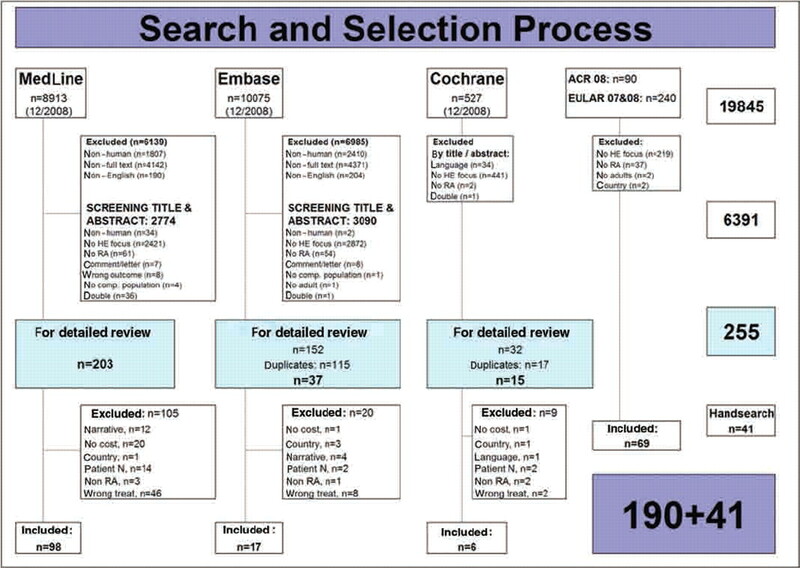 To maximise retrieval of all pertinent papers we applied medical subject headings (‘MeSH’ terms), or keyword searches when at all appropriate. Box 1 and table 1 provide the specific details of the search strategies. After scanning all titles and abstracts, we retrieved the full text for all potentially relevant studies. These retrieved articles were also hand searched for further references. We did not exclude studies of poor quality, but did subsequently assess all papers for quality using the Oxford EBM Level of Evidence classification.13 Lastly, to account for potential bias, we extracted the funding source stated in the original publications (table 2). *Arthritis, Rheumatoid/co, ec, rh, su, th, dt, sn, co, ec, su, rh, th, nu, px, mo, dt, pc OR *Arthritis, Rheumatoid/ OR rheumatoid arthritis.mp. Where possible, we collected cost effectiveness results as an incremental cost-effectiveness ratio (ICER), the most frequently reported outcome in cost-effectiveness analyses (CEAs) reflecting the additional cost per quality-adjusted life-year (QALY) gained by a particular treatment. Although the exact societal willingness-to-pay threshold remains controversial, based on ICERs of other commonly accepted medical interventions, we defined ICERs below US$50 000–100 000 per QALY, as being cost effective. The costs considered for QALY derivation in CEAs included direct costs (ie, cost of the drug, drug monitoring and adverse events, hospital visits, etc) in all publications, while heterogeneous approaches were taken for the inclusion of indirect costs (generated by loss of patient productivity). Where available, we report on how the QALYs were calculated. Presumably because biological treatments are far more expensive than traditional DMARDs or glucocorticoids, the majority of published cost-effectiveness studies examined biological treatments (40 of 54) while few considered synthetic disease-modifying antirheumatic drugs (DMARDs).14,–,21 The following sections present the CEA results for different treatment options according to their treatment indications with results specified as ICERs if available. Published incremental cost-effectiveness ratios. x-Axis=incremental cost-effectiveness ratio in US$ per quality-adjusted life-year gained (log scale); y-axis=indication for the use of biological agents; dots represent reported ICERs of the drugs investigated. Values to the left of the vertical lines at US$50 000 and US$100 000 are commonly considered to be cost effective. Note, that comparing ICERs between trials is inappropriate. ABA, abatacept; ADA, adalimumab; DMARD, disease-modifying antirheumatic drug, ETA, etanercept; ICER, incremental cost-effectiveness ratio; IFX, infliximab; RTX, rituximab; TNFi ns., tumour necrosis factor α inhibitor, not specified. Cost-effectiveness of ADA or ETA monotherapy when compared with MTX monotherapy in DMARD naïve patients depends on where cost-effectiveness thresholds are set.20 28 29 In a CEA presented by Spalding and Hay,29 starting treatment with ADA monotherapy produced a high ICER (US$63 769) than with MTX monotherapy, and starting with ETA monotherapy was calculated to produce an even higher ICER of US$89 772. When sensitivity analyses on ETA were performed that also accounted for productivity outcomes, ETA use resulted in lower ICERs, but still ranged above the US$50 000 threshold (US$78 691). Choi et al20 compared several treatment options in MTX naïve patients, among them ETA monotherapy. In this study, the ICER was calculated by use of probabilities of achieving ACR20 or ACR70 weighted response (WR) instead of QALYs, which makes outcomes difficult to compare. The authors conclude that whether this option is cost effective when compared with MTX monotherapy depends on whether >US$40 000 per additional 6 month ACR20 or ACR70 response is considered acceptable.20 Chen et al28 calculated ICERs in the cost-effective range for ADA and ETA monotherapy used as first-line agents (figure 2, tables 3 and 4). Using first-line combination of MTX and TNFi as initial treatment in early RA resulted in high ICERs in several studies.21 28 29 This strategy precludes initial MTX monotherapy, and subsequent escalation with TNFi if necessary. Even though initial combination therapy including biological agents has shown clinical superiority over monotherapy,27 there is currently no evidence supporting this strategy with regards to cost effectiveness. MTX is comparably cheap,28 yet efficient, in many patients. There are currently no effective ways to predict poor treatment success with MTX alone, therefore, also from the cost-effectiveness perspective, a course of MTX should be encouraged in all patients without contraindications, and an initial combination of TNFi with MTX cannot be considered cost effective.28 29 The lowest ICER was generated for ETA plus MTX, but this still amounted to £78 000 (year of pricing 2004).28 A few CEAs showed relatively lower ICERs: in one abstract30 31 from 2008, first-line use of ETA in combination with MTX had an ICER of €24 655 for severe disease and €30 199 for highly active disease, respectively, when compared with a strategy of second-line ETA added to MTX. Similarly, ADA plus MTX32 in early RA had an ICER of US$23 377 per QALY based on effectiveness data from registration trials25,–,27 sponsored by industry (see table 2). Consequently, an initial combination of TNFi with MTX was not felt to be consistently cost effective in comparison with initial MTX monotherapy. Apart from CEA publications, there is currently also no definite evidence from subanalyses and follow-up data of clinical trials that indicates a preference for initial combination therapy. In a recently published subanalysis of the BeSt study,33 whether IFX costs could be largely compensated by productivity increases depended on the value attached to productivity gains. When using the so called friction method to calculate productivity costs, a similar effect on productivity could also be achieved by the much less expensive strategy that included an initial combination therapy with high-dose prednisone.33 The authors note, that longer follow-up data should be gathered to correctly evaluate patterns of IFX use. Indications for cost effectiveness of an initial TNFi combination therapy come from subanalyses of the Premier trial34 and the PROWD study,35 which found significantly better outcome for indirect costs (work loss, performance and sick leave) with early combination therapy including ADA versus MTX alone. These studies did not investigate the potential effect of higher-dose steroids. Given its higher price, only LEF has been investigated intensively among synthetic DMARDs.22 36 37 Studies argued, however, that a strategy including LEF might be worthwhile by potentially postponing the initiation of biological agents. In short, ICERs reported for this strategy when compared with TNFi are above acceptable thresholds.36 Use of LEF after DMARD failure, followed by a switch to ETA only if LEF proved insufficient after 3 months, was considered to be more cost effective than using ETA earlier,36 but still an ICER of £163 556 was reported. However, indirect costs were not incorporated. The efficacy data used38 reported LEF outcomes in comparison with MTX (ie, investigating MTX naïve patients). In the absence of direct comparison trials for patients qualifying as candidates for TNFi, in the model LEF was arbitrarily assumed to be 25% less effective when following MTX failure36 than when used in MTX naïve patients. Considering society's willingness to pay ICER thresholds of US$50 000–100 000, a combination of TNFi plus MTX as a group is cost effective after synthetic DMARD failure,28 39 with thorough analyses of ADA,40 41 ETA40,–,45 and IFX.44 46,–,49 For IFX, a limitation has been raised and confirmed in cost-minimisation analyses50 51—namely, that the doses of IFX have to remain constant over time,28 40 although this analogously will apply to the use of higher doses of other TNFi, which has, however, not been investigated. With the exception of one study, which was based on a comparison of non-head-to-head trials and therefore different trial populations,28 there is no strong evidence that one TNFi is better than another. With increasing functional disability at baseline, lower ICERs are observed in this indication (Health Assessment Questionnaire (HAQ) <0.6: ICER=€128 500, year of publication 2002; vs HAQ >2.1: ICER=€43 00044). Some criticism has been raised of these TNFi cost-effectiveness results,36 46 52 53 specifically arguing that high ICERs depend on the methods used to determine utility46 or objecting to generally higher ICERs36 52 53 (table 3). For some of these studies, there has been a re-evaluation of the publications by newer data published by the same group (Jobanputra et al52 published updated papers in 200454 and 200628). The exceptionally high ICERs reported by Welsing et al36 did not incorporate indirect costs. A Canadian study53 also presented ICERs above the US$100 000 threshold but in sensitivity analyses considered a higher impact on indirect costs. However, this study did not specify how ICERs were derived. Choi et al55 again used an ACR20 and ACR70 WR making ICER comparisons problematic (table 3). Anakinra has not been considered cost effective in two CEAs,40 56 essentially because of its low efficacy in RCTs.56 Abatacept (ABA) after MTX failure has been investigated recently and was suggested to be cost effective57 based on efficacy data from the AIM trial.58 For this indication, our search also retrieved one abstract presented at the EULAR 2008 conference,59 but specific results and data are unavailable. Rituximab (RTX) has been shown to be cost effective60,–,62 based on modelling of REFLEX trial data.62 63 In this indication, ABA was also reported as cost effective64,–,66 (models were based on ATTAIN trial data,67 the latter studies were sponsored by Bristol-Myers Squibb; table 2), although it has initially been rejected by the National Institute for Health and Clinical Excellence report68 because it exceeds the £30 000 threshold. To date, there are no randomised head-to-head comparisons of RTX and ABA available. In an abstract report, ABA was postulated to be more cost effective than RTX64 in a model derived from AIM58 and REFLEX.63 Comparison of the two has also been undertaken and reported by Gossec et al69 as an abstract. There is little evidence on this treatment option, reflecting again the absence of RCT data. Chen et al28 found ETA, unlike ADA and IFX, to be cost effective when used as the second, and even as the third TNFi (table 3), but in their models, sequential TNFi use was compared with the treatment option of returning to DMARD treatment only. A treatment sequence of ETA following ADA plus MTX had a calculated ICER of US$19 663,32 and similarly Brennan et al39 reported favourable ICERs for use of a second TNFi, when investigating TNFi as a class versus DMARD treatment (table 3). In the TICORA70 study, aggressive versus conservative treatment was also analysed for cost effectiveness: at 18 months, higher costs had accrued in the group treated aggressively (due to a larger number of outpatient visits, and higher costs for travel, diagnostic tests and prescriptions), but were offset by considerably lower costs in this group owing to lower hospitalisation costs and fewer additional health professional visits. Of note, in a CEA, that compared symptomatic versus aggressive treatment in late RA,71 symptomatic treatment was more cost effective than intensive treatment. In a subanalysis of the FinRA-Co,72 combination DMARD treatment with glucocorticoids was shown to be a protective factor against productivity loss after 5 years of follow-up. Also, two COBRA subanalyses73 74 found combined treatment effective at equal or lower costs than monotherapy. The results of this literature research have been incorporated in guidelines for RA management by use of a set of recommendations as summarised in table 5. Despite heterogeneous methods applied in CEAs making it difficult to compare studies,75 76 economic analyses support the EULAR RA treatment recommendations. In particular, the economic analyses support the concept of an early start of traditional DMARDs, and rapid treatment escalation when there is insufficient response. In this strategic setting, the considerably more costly biological treatments appear to provide sufficient cost effectiveness. The current EULAR RA treatment recommendations are consistent with prudent use of societal resources. To reflect the long-term functional impairment from RA, productivity losses should be considered in sensitivity analyses.
. Costs of rheumatoid arthritis: new estimates from the human capital method and comparison to the willingness-to-pay method. Med Decis Making 2007;27:138–50.
. Rheumatoid arthritis: what does it cost and what factors are driving those costs? Results of a survey in a community-derived population in Malmö, Sweden. Scand J Rheumatol 2007;36:179–83.
. The costs of rheumatoid arthritis: an international long-term view. Semin Arthritis Rheum 2000;29:305–20.
. Cost of illness studies in rheumatic diseases. Curr Opin Rheumatol 2002;14:121–6.
. Direct medical costs and their predictors in patients with rheumatoid arthritis: a three-year study of 7,527 patients. Arthritis Rheum 2003;48:2750–62.
. Harrison's rheumatology. New York, USA: McGraw-Hill, 2006.
. Systematic review of studies of productivity loss due to rheumatoid arthritis. Occup Med (Lond) 2006;56:18–27.
. Influence of rheumatoid arthritis on work participation in Australia. Intern Med J 2008;38:166–73.
. Disease status, costs and quality of life of patients with rheumatoid arthritis in France: the ECO-PR Study. Joint Bone Spine 2008;75:408–15.
. Indirect medical costs in early rheumatoid arthritis: composition of and changes in indirect costs within the first three years of disease. Arthritis Rheum 2001;44:528–34.
. Cost-effectiveness in health and medicine. New York, USA: Oxford University Press, 1996. University of Oxford, Centre for Evidence Based Medicine, EBM Tools. Finding the Evidence – Levels of Evidence (March 2009). http://www.cebm.net/index.aspx?o=1025 (Accessed 28 May 2009).
. Modelling cost effectiveness and cost utility of sequential DMARD therapy including leflunomide in rheumatoid arthritis in Germany: I. Selected DMARDs and patient-related costs. Pharmacoeconomics 2005;23:377–93.
. Modelling the costs and effects of leflunomide in rheumatoid arthritis. Eur J Health Econ 2002;3:180–7.
. Cost effectiveness analysis of disease modifying antirheumatic drugs in rheumatoid arthritis. Rheumatol Int 2007;27:1063–9.
. Economic comparison of leflunomide and methotrexate in patients with rheumatoid arthritis: an evaluation based on a 1-year randomised controlled trial. Pharmacoeconomics 2002;20:61–70.
. A cost effectiveness analysis of cyclosporine in rheumatoid arthritis. J Rheumatol 1996;23:609–16.
. The cost effectiveness of auranofin: results of a randomized clinical trial. J Rheumatol 1988;15:35–42.
. A cost effectiveness analysis of treatment options for methotrexate-naive rheumatoid arthritis. J Rheumatol 2002;29:1156–65.
. Treatment of very early rheumatoid arthritis with symptomatic therapy, disease-modifying antirheumatic drugs, or biologic agents: a cost-effectiveness analysis. Ann Intern Med 2009;151:612–21.
. Modelling cost effectiveness and cost utility of sequential DMARD therapy including leflunomide for rheumatoid arthritis in Germany: II. The contribution of leflunomide to efficiency. Pharmacoeconomics 2005;23:395–420.
. Function and health-related quality of life: results from a randomized controlled trial of leflunomide versus methotrexate or placebo in patients with active rheumatoid arthritis. Leflunomide Rheumatoid Arthritis Investigators Group. Arthritis Rheum 1999;42:1870–8.
. Cost effectiveness of tumour necrosis factor-alpha inhibitors as first-line agents in rheumatoid arthritis. Pharmacoeconomics 2006;24:1221–32.
. Cost-effectiveness of using etanercept as first line treatment in severe and highly active rheumatoid arthritis patients [abstract]. Ann Rheum Dis 2008;67(Suppl II):P573.
. Economic benefit of achieving clinical and radiographic remission with etanercept as first line treatment in severe and highly active rheumatoid arthritis patients [abstract]. Presentation at the Annual Scientific Meeting of American College of Rheumatology, 27 October 2008. ACR abstract 795.
. Cost-effectiveness of sequential therapy with tumor necrosis factor antagonists in early rheumatoid arthritis. J Rheumatol 2009;36:16–26.
. An estimate of indirect cost savings in patients with early rheumatoid arthritis: sub-analysis of the premier health outcomes companion study [abstract]. Ann Rheum Dis 2008;67(Suppl II):P650.
. Improved work stability and reduced job loss with adalimumab plus methotrexate in early rheumatoid arthritis: results of the prevention of work disability (PROWD) study [abstract]. Ann Rheum Dis 2007;66(Suppl II):P176.
. Modeling the 5-year cost effectiveness of treatment strategies including tumor necrosis factor-blocking agents and leflunomide for treating rheumatoid arthritis in the Netherlands. Arthritis Rheum 2004;51:964–73.
. Cost effectiveness of adding leflunomide to a 5-year strategy of conventional disease-modifying antirheumatic drugs in patients with rheumatoid arthritis. Arthritis Rheum 2002;47:655–61.
. Two-year, blinded, randomized, controlled trial of treatment of active rheumatoid arthritis with leflunomide compared with methotrexate. Utilization of Leflunomide in the Treatment of Rheumatoid Arthritis Trial Investigator Group. Arthritis Rheum 2001;44:1984–92.
. Modelling the cost effectiveness of TNF-alpha antagonists in the management of rheumatoid arthritis: results from the British Society for Rheumatology Biologics Registry. Rheumatology (Oxford) 2007;46:1345–54.
. Biologic drugs for rheumatoid arthritis in the Medicare program: a cost-effectiveness analysis. Arthritis Rheum 2008;58:939–46.
. Cost effectiveness of adalimumab in the treatment of patients with moderate to severe rheumatoid arthritis in Sweden. Ann Rheum Dis 2005;64:995–1002.
. 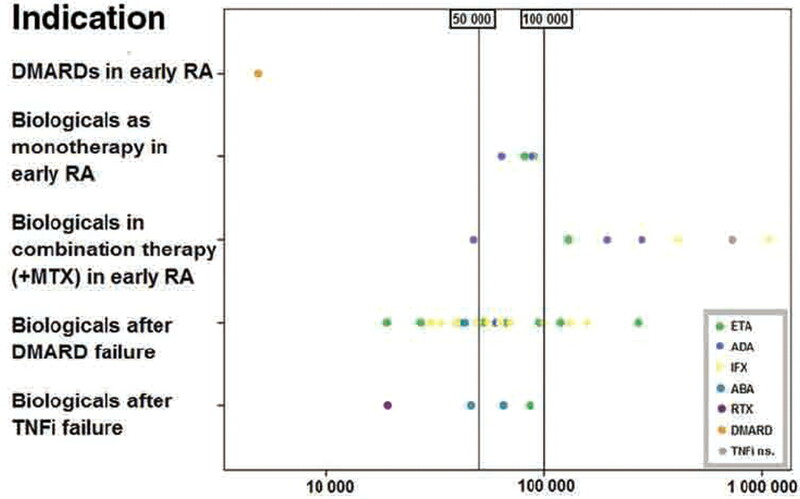 Cost-effectiveness analysis of biological treatments for rheumatoid arthritis. Expert Rev Pharmacoecon Outcomes Res 2004;4:307–15.
. Cost effectiveness of etanercept (Enbrel) in combination with methotrexate in the treatment of active rheumatoid arthritis based on the TEMPO trial. Ann Rheum Dis 2005;64:1174–9.
. TNF inhibitors in the treatment of rheumatoid arthritis in clinical practice: costs and outcomes in a follow up study of patients with RA treated with etanercept or infliximab in southern Sweden. Ann Rheum Dis 2004;63:4–10.
. Modelling the cost-effectiveness of etanercept in adults with rheumatoid arthritis in the UK. Rheumatology (Oxford) 2004;43:62–72.
. Not all “quality-adjusted life years” are equal. J Clin Epidemiol 2007;60:616–24.
. The cost effectiveness of infliximab for severe treatment-resistant rheumatoid arthritis in the UK. Pharmacoeconomics 2005;23:607–18.
. The cost-effectiveness of infliximab (Remicade) in the treatment of rheumatoid arthritis in Sweden and the United Kingdom based on the ATTRACT study. Rheumatology (Oxford) 2003;42:326–35.
. Estimating the cost-effectiveness of 54 weeks of infliximab for rheumatoid arthritis. Am J Med 2002;113:400–8.
. A cost-cost study comparing etanercept with infliximab in rheumatoid arthritis. Pharmacoeconomics 2001;19:1051–64.
. Cost of care for patients with rheumatoid arthritis receiving TNF-antagonist therapy using claims data. Curr Med Res Opin 2007;23:1749–59.
. The effectiveness of infliximab and etanercept for the treatment of rheumatoid arthritis: a systematic review and economic evaluation. Health Technol Assess 2002;6:1–110.
. Infliximab and etanercept in patients with rheumatoid arthritis: a systematic review and economic evaluation. Ottawa, ON: Canadian Coordinating Office for Health Technology Assessment, 2006:64.
. The use of modelling to evaluate new drugs for patients with a chronic condition: the case of antibodies against tumour necrosis factor in rheumatoid arthritis. Health Technol Assess 2004;8:iii, 1–91.
. A cost-effectiveness analysis of treatment options for patients with methotrexate-resistant rheumatoid arthritis. Arthritis Rheum 2000;43:2316–27.
. Cost-effectiveness of abatacept in patients with moderately to severely active rheumatoid arthritis and inadequate response to methotrexate. Rheumatology (Oxford) 2008;47:535–41.
. Cost-efficacy of abatacept and infliximab among inadequate responders to methotrexate in the treatment of rheumatoid arthritis [abstract]. Ann Rheum Dis 2008;67(Suppl II):P647.
. UK cost-utility analysis of rituximab in patients with rheumatoid arthritis that failed to respond adequately to a biologic disease-modifying antirheumatic drug. Curr Med Res Opin 2008;24:2639–50.
. Budget impact of rituximab (Mabthera) after failure of one or more TNF inhibitor therapies in the treatment of rheumatoid arthritis [abstract]. Ann Rheum Dis 2007;66(Suppl II):P435.
. Economic consequences of providing rituximab as a treatment alternative for rheumatoid arthritis in the Netherlands [abstract]. Ann Rheum Dis 2007;66(Suppl II):P272.
. The cost-effectiveness of abatacept versus rituximab in patients with rheumatoid arthritis in the United States [abstract]. Ann Rheum Dis 2008;67(Suppl II):P582.
. Cost-effectiveness of abatacept in patients with moderately to severely active rheumatoid arthritis and inadequate response to tumor necrosis factor-alpha antagonists. J Rheumatol 2008;35:1745–53.
. Cost-effectiveness modeling of abatacept versus other biologic agents in DMARDS and anti-TNF inadequate responders for the management of moderate to severe rheumatoid arthritis. Clin Rheumatol 2009;28:403–12. NICE Technology Appraisal Guidance 141. Abatacept for the treatment of rheumatoid arthritis. NHS National Institute for Health and Clinical Excellence, 2008.
. Cost-effectiveness simulation model of abatacept versus rituximab in rheumatoid arthritis in France [abstract]. Ann Rheum Dis 2008;67(Suppl II):P609.
. The British Rheumatoid Outcome Study Group (BROSG) randomised controlled trial to compare the effectiveness and cost-effectiveness of aggressive versus symptomatic therapy in established rheumatoid arthritis. Health Technol Assess 2005;9:iii–iv, ix–x, 1–78.
. Predictors of productivity loss in early rheumatoid arthritis: a 5 year follow up study. Ann Rheum Dis 2005;64:130–3.
. Cost-effectiveness and cost-utility of combination therapy in early rheumatoid arthritis: randomized comparison of combined step-down prednisolone, methotrexate and sulphasalazine with sulphasalazine alone. COBRA Trial Group. Combinatietherapie Bij Reumatoïde Artritis. Br J Rheumatol 1998;37:1102–9.
. Indirect and total costs of early rheumatoid arthritis: a randomized comparison of combined step-down prednisolone, methotrexate, and sulfasalazine with sulfasalazine alone. J Rheumatol 2004;31:1709–16.
. An overview of economic evaluations for drugs used in rheumatoid arthritis: focus on tumour necrosis factor-alpha antagonists. Drugs 2005;65:473–96.
. A comparison between integrating clinical practice setting and randomized controlled trial setting into economic evaluation models of therapeutics. J Eval Clin Pract 2006;12:463–70.
. Budget impact model of rituximab after failure of one or more TNFalpha inhibitor therapies in the treatment of rheumatoid arthritis. Joint Bone Spine 2008;75:688–95.